Piety is infact aim of life and provision of the hereafter. Piety is base of perfect faith and heritage of Saints. Piety is Allah’s favour upon umma. Piety is a will of Allah. It is an elevated spiritual station. In fact, believer remains imperfect without piety as it a purification of soul, medium to gain blessings of Divine vision and key to His ultimate closeness and gnosis. Its literal meaning is ‘shield’, thus it saves one from dangers and harms. Whereas in sharia, piety is to avoid oneself from every act and thought which brings torment of Allah. Moreover, piety means to follow that path which blesses one with happiness of Allah. “Literally, piety means to have fear of Allah, abstain from sins and adopt pious deeds but in reality, piety is a state of the inward’s closeness to Allah. The more a person’s inward is close to Allah the more he will be pious. The Hadith endorses a fact that once someone asked the Prophet about piety, he pointed towards his heart and said, “Piety is here”. Therefore, piety is an inner state of a person, which ultimately leads to have the vision of Allah. There are four alphabets in Taqwa i.e. piety تقویٰ (ت، ق، و، ی) . ت (TA) indicates toward Tawhid that is One of Allah i.e. to reject everything other than Allah. But this only possible with the greatest name of Allah. ق (Q) means to culminate and purify innerself, which is merely possible through the beneficence of perfect spiritual guide. و (WA) refers to the steps by steps journey towards Oneness. ی (YA) means invocation of یاھو Ya’ Hoo which is medium to gain Divine love and gnosis. Therefore, these words are not meaningless. Hence, piety is a provision of next word for the seeker of Allah. In this world of multiplicity, there is Oneness everywhere. Oneness is the ultimate station of faith. Oneness is not the single station rather is like a creeping plant which has infinite stations in it. Therefore, believers travels on this path step by step. Although it is upto a believer that how much he waters this creeping plant with Divine love, gnosis and piety. In fact, it a journey from verification by tongue to verification by inward which makes one to dive in the deep ocean of closeness of Allah. There are five alphabets in Tawhid توحید i.e. Oneness. ت (TA) means Taqwa i.e. piety. In fact, when one adopts piety, he becomes aware of the secret of Oneness. و (WA) represent wahdat-ul-wajud i.e. Oneness of Being. Infact, one reaches at the ultimate level of gnosis. ح (HA) represent hamiyyat-e-Khudawandi i.e. will of God. It means one become aware of all the secrets of all the worlds by the will of Allah. ی (YA) refers to unveiling of the reality of YaHoot i.e. realm of First Manifestation. د (DA) refers to renounce the world and follow the slogan of “Everything is lust other than Allah”. 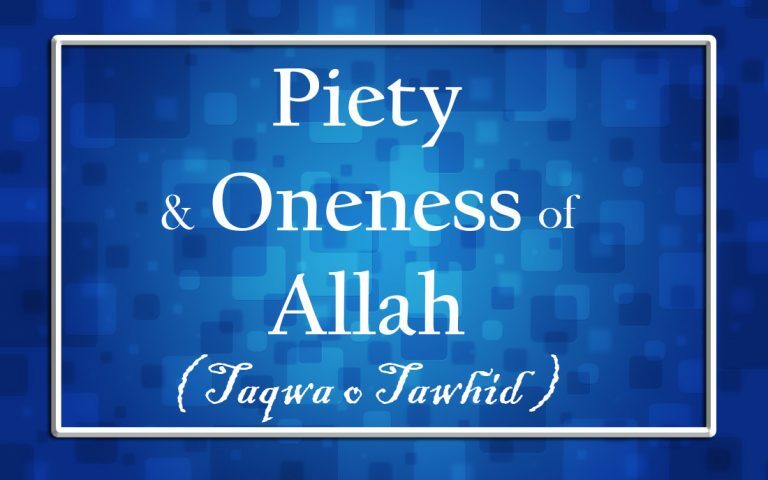 In fact, annihilation and immortality with Allah is the path of piety and Oneness. Actually, piety and Oneness are reciprocal to each other. On one side, one cannot disclose the secret of Oneness without adopting piety, whereas on other side, Oneness is base of piety. More the seeker is perfect in piety, the more he will be aware of Oneness of Allah. Similarly, more the seeker discloses the reality of Oneness, the more he will become pious. Hence, piety and Oneness are the strength of believer. Again, in this verse, Allah has ordered to follow the path of piety and when one dies, his soul must testifies Oneness of Allah. Such is the soul of Muslim. In fact, Oneness and piety are the reality of faith. Therefore, all five pillars have piety and Oneness in them. Thence, one cannot unveil the reality of Islamic creed if he does not forbid himself from polytheism no matter he is a honourable scholar. Infact, to save oneself from indecency and impiety, which bring anger of Allah, is a piety. Meaning: Proclaim: ‘He is Allah, Who is the One. Allah is the Transcendent of all, the Protector and Far-Superior to all. He has not begotten any, nor is He begotten. Nor is there anyone equal to Him. Hence, salat is a medium to gain closeness of Allah and it is Miraj of believer. However, such stations of salat are unveiled upon men of piety. If one does not have piety in his inward then only the words of Islamic creed and surah Al-Ikhlaas cannot bless him, thus his salat is dejected. Every act performed without piety is useless. Infact, piety is seed of Divine love and Oneness is fruit of Divine love. Explanation: Prostration full of Divine love is a real pleasure for inward. Where prostration, which lacks Divine love is full of materialistic world. This verse clarifies that the purpose behind fasts is to achieve piety. Infact, fasting blesses seeker of Allah with piety and Oneness of Allah as He says: Fasting is for Me, and I Myself is its reward.” Thus, the piety achieved through fasting takes the seeker to the station of Divine Oneness. Meaning: Actions are judged by their intentions. Undoubtedly, it is the ultimate blessing of Allah that he bestows His slave with His gnosis through piety. It is obligatory for every Muslim who possesses strength and resources to perform it. It is a best way to gain blessings of piety and Oneness of Allah. The one who sets out for hajj, he sacrifices his wealth and love of children for Allah. He witnesses the grandeur of Allah in Kaaba. He repents on his sin and seek forgiveness from Allah. Thus, he believes that only Allah can save and bless him. In this way, he gains the blessings of piety and Oneness of Allah. Thus, it is is evident from above-mentioned Hadiths and verses of Quran that Oneness of Allah and piety is the base and essence of every pillar of Islam. Therefore, one can say that without piety there is no faith. Even one cannot be a Muslim. Infact, he verifies Islamic creed i.e. Oneness verbally only. His inciting innerself is his god and thus he indulges himself in polytheism. Allah does not care about such a betrayed and misled, as He only judges His slaves through their inward and intentions and thus blesses them with His Oneness. Piety of Commoner: For common people. This means dislike for heresy and polytheism. Piety of Pious People: It means abstaining from sins and crimes prohibited by sharia. Special People’s Piety: Rooting out evil whispers during prayer and worship. Those who claim to be a true slave of Allah, they should travel from piety of commoner piety of blessed people. Like piety, there are different ranks of Oneness of Allah. Elevated stations of piety blesses seeker with exalted stations of Oneness. Nominal Muslims perceive piety and Oneness two different things. This is only believers who know that they are interrelated and reciprocal to each other. Hence, he finds the ultimate station of Oneness through piety. First level is of those people who verifies Islamic creed verbally but infact their inwards do not believe in it. Second level is that one believes in Islamic creed just as a belief (he does not know its reality). Third level is that one witnesses Oneness of Allah by observation. He observes that He is the One Who is behind everything. This level is not like first two levels as their belief is like a knot which they have bonded (temporarily) by following others or for some other reason. Although the status of third level of Oneness is elevated but its not the final level. Like the one cannot learn outward knowledge without a teacher, similar to it, gaining esoteric knowledge is impossible without the association of the perfect spiritual guide. He is the one who is the spiritual successor and representative of Prophet Mohammad hence he is the perfect spiritual guide possessing the Divine light of guidance. He guides the seeker of Allah towards Allah. He blesses seeker with Ism-e-Allah Zaat and with his spiritual persuasion and sight he removes all the impurities from the being of the seeker making his inward pure. Seeker feels change in himself and people around him also feel change in him. Those purified soul fears Allah, thus they prohibit themselves from wrongdoings and adopt those deeds, which bring closeness of Allah to them. Hence, they attain the state of piety. He enlightens the inward of seekers with beneficence of Ism-e-Allah Zaat. It is compulsory for the seeker to invocate and contemplate Ism-e-Allah Zaat by the permission of perfect spiritual guide. Above-mentioned saying of Sultan Bahoo is a proof that Ism-e-Allah Zaat is a ladder to Oneness of Allah. Ism-e-Allah Zaat blesses seeker with gnosis of Hoo and discloses the reality of Islamic creed. It inculcates piety into the inwards of seeker, makes him believer, and thus blesses him with union with Allah. Hence, there remains no veil between Hoo and slave of Hoo. The souls returns to its origin in its purest form. But it is compulsory to gain Ism-e-Allah Zaat from perfect spiritual guide of Sarwari Qadri Order to achieve the station of Oneness through piety. It an era of materialism. The scholars of today have misguided people. They preach to adopt piety for the sake of fear of hell. They have confined the verification of Islamic creed to tongue only i.e. verbally. Although, Oneness and piety is a complete faith and its origin. One who does not possesses piety, he cannot have Oneness of Allah and one who does not believe in Oneness of Allah, he cannot have piety. Although, they are two different things but they are present into each other. One cannot witness Oneness without piety. In the present era, there is a man of perfection who is distributing the blessings of Oneness and piety generously. He is none other than ‘Founder of Tehreek Dawat-e-Faqr Sultan-ul-Ashiqeen (Sultan of Divine lovers) Sultan Mohammad Najib-ur-Rehman. It is the first time in history that he blesses the devotee after oath of allegiance with Ism-e-Allah Zaat and sultan of invocation i.e. Hoo. Moreover, he blesses seekers with Ism-e-Allah Zaat even without oath of allegiance. Thus, he is putting his best possible effort to guide people towards the path of Faqr. He keeps blessing his devotees with stations of Oneness of Allah and thus blesses them with gnosis of Allah. A book has been published on Sultan-ul-Ashiqeen Sultan Mohammad Najib-ur-Rehman. There is a complete chapter in that book which are testimonies of different disciples who acknowledge his grand status of perfect spiritual guide and Divine Universal Man. There is no doubt one cannot have access to any spiritual station of Oneness of Allah without his blessing and permission. Tehreek Dawat-e-Faqr invites you to gain these blessings.